We have a squatter on our front porch. Not on the porch, exactly. Suspended over the porch, sort of. Remember those hanging flower baskets my grandchildren gave to me for Mother’s Day? A Mama Robin is squatting in one of them. The little red-breasted trespasser built her perfectly constructed illegal nest in the middle of the basket on top of several of the flowering plants. It will probably kill them all. I’ll get the blame, of course, given my reputation as a serial plant killer. Macho Guy was the one to discover the squatter. He was watering the hanging plants when Mama Robin surprised him by flying up out of one of the baskets. I think she didn’t appreciate the unexpected shower, for one thing. For another, I think she was attempting to lure the human predator away from the hanging basket. MG was curious to see what the robin was doing in the hanging basket, so he took it down and set it on the porch bench. Once he peered into the basket, he called me to come outside and have a look. MG: You’re not going to believe this. [He pointed to the basket.] Look in there. 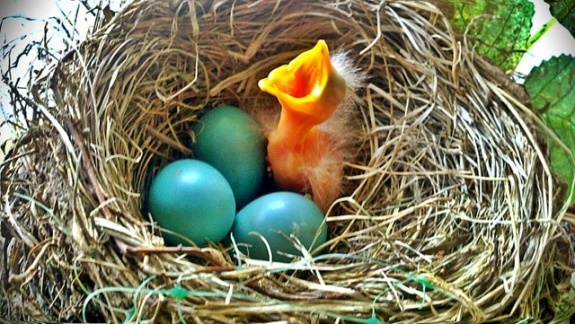 My mouth hung open at the sight of three little blue eggs in a perfectly formed nest. ME: That’s a robin’s nest! MG: Yeah, she flew out of there when I started watering. [He shook his head.] If we leave her nest in there, those flowers will die. ME: But if we move it, the mother won’t go back to it and the babies won’t hatch. MG: So, what do you want to do? They’re your flowers. ME: [softie that I am] Just water around the nest. 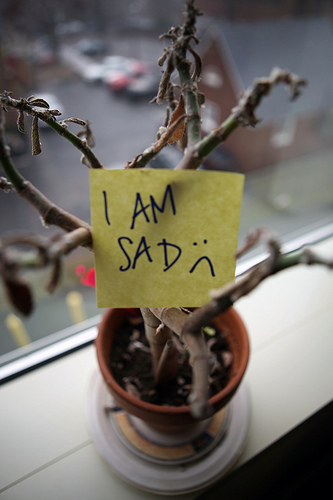 Maybe the plants won’t die. ME: Yes. I’ll explain to the grandkids. They’ll understand. Just to be on the safe side, I took a photo of the nest in the event I needed proof. We checked through the window from time to time to see if Mama Robin returned to the nest. She did eventually. When we peek out the window, we can see her head above the rim of the basket while she’s sitting on her eggs. If she catches us looking through the window at her, she ups and flies away. She does the same thing whenever we open the front door. He was right about that. It was weird. 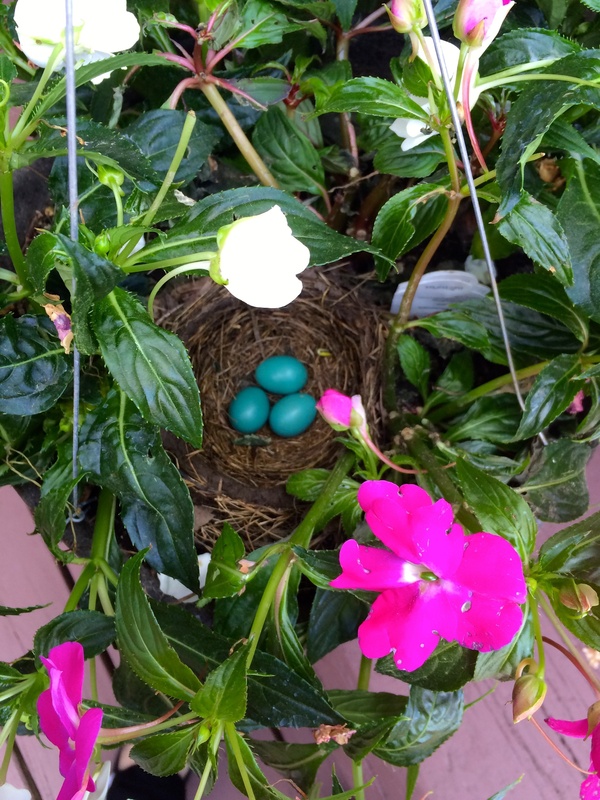 I never heard of a bird nesting in a hanging flower basket before, but I suppose Mama Robin was desperate for a protected place to build, thanks to MG.
Every year, the robins build a row of nests on the beams below our back deck, creating a bird’s nest condo. The beams offer protection from the wind and wet weather, and are inaccessible to cats. The robins make quite a mess, so MG knocks the nests down before the robins can lay their eggs in the hope they’ll go somewhere normal, like a tree, to build their nests. My theory is that in her search for a safe place to rebuild, Mama Robin spotted the hanging flower baskets. They were hanging under the eaves, protected from wind and rain—and cats. The flowers provided camouflage, a perfect hiding place. The only things Mama Robin didn’t count on were the two of us and our watering can. We try not to intrude except to water the hanging basket flowers every other day. We’re letting Mama Robin have her space. I watered the flowers this afternoon and she flew off, of course. I took a peek into the basket. The eggs haven’t hatched yet, dang it. I hope they hatch before we go on vacation because I’d sure hate to miss seeing those little baby robins.